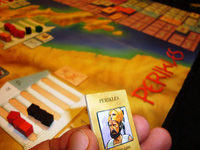 A couple of times last year we played Perikles, a game designed by Martin Wallace in 2006 for his Warfrog Games Company (now known as Treefrog Games). 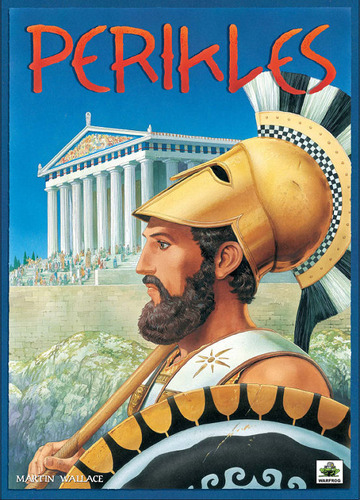 It’s a political/military game set in Ancient Greece. 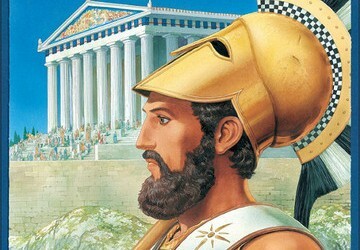 Players represent families struggling to control 6 politically important cities: Athens, Sparta, Corinth, Thebes, Agora and Megara. A typical game lasts about 2 hours and has between 2 and 5 players. Perikles is basically two games in one. During the first half of a turn players fight over each city in an area control manner, while in the last half of a turn they conduct an abstract form of warfare over their colonies. This game is so abstract that there isn’t any type of movement. That is, its not a hex to hex or point to point game. You simply place cubes and counters on the various cities or colonies and remove them when necessary. Players start the game with a set of cubes that represents family members living throughout the region. 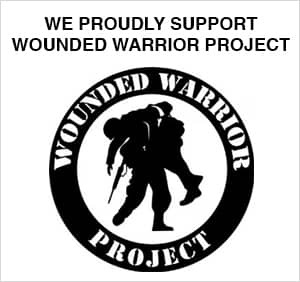 They then pick chits with various abilities in order to add to their family’s influence in a particular city, or assassinate an opposing figure (remove another player’s block) or nominate a politician for a position of leadership in a city. The faction with the most influence in a city at the end of this phase gets to control its military for this turn. But only the player who controls a city at the end of the game gains its Victory Points. 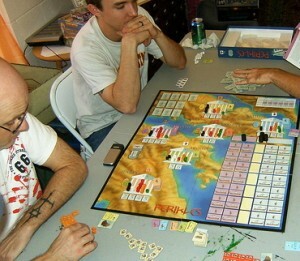 During the second half of each turn, players fight over seven random colony tiles placed on the board, which are worth Victory Points on their own. However, in one of the cleverer parts of this design, the more times a city loses a battle, the fewer Victory Points it’s worth when the game ends. Lose too many battles and people lose interest. 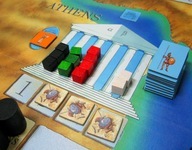 During In the first part of a turn players contest control of the various city-states throughout Greece. In the above example, Athens has four factions vying for control. At this point the red faction appears in the lead. If you look closely, you will see there is room for only 5 players in each city. A player’s cubes, which represent his influence in a city, are placed in the blue areas between the columns in the above photo from BGG. Combat involves players placing their hoplite and trireme chits on the board face down in order to attack or defend various colonies. They can either be the main attacker/defender or be placed in a supporting role. Players then turn over the military chits they have secretly assigned to a colony and calculate the odds for its land and/or naval battle. Combat results are determined by cross-referring the odds with the force’s status as the attacker or defender, after which each player rolls 2D6. So, say, at 2 to 1 odds the attacker may have to roll a 7 or higher on 2 dice in order to hit while the defender must roll a 6 or higher. Whoever first scores two hits wins this portion of the combat and starts the second portion with a hit. The fight then moves on to the remaining land or sea portion of the contest and whoever then wins this second round wins the overall battle for control of the colony. There are only three turns in this game, but there is plenty to do in each of them. In fact this is probably the longest “three turn” game I have ever played. That’s not the problem. What I found annoying is the fiddiness of the rules and the randomness involved, and while the game does include a number of clever bits, it just seemed to me boring. Where was Perikles? Where were the dramatic turns of events the Peloponnesian War was famous for? And where was Alcibiades? The man known for being on four sides of a 2 sided war? Where were Ostracisms? Raiding? Plagues? Oracles? Massacres? Sieges? 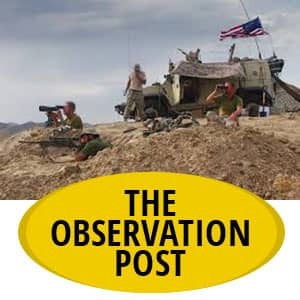 Religious controversies? Democracy? Oligarchy? Tyranny? Political intrigues? The Sicilian Campaign? Or double and triple crosses? 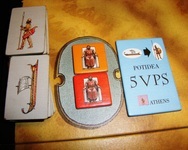 Examples of Hoplite and Trireme counters may be seen along the left side of the above photo from BGG. A colony counter and the number of Victory Points control of it affords appears on the right. Now, I’m not an expert in Ancient Greek politics, but what I – and others – have a problem with is understanding what the core mechanic of this game represents. Yes, families had relatives, friends, followers and acquaintances in multiple cities for all sorts of reasons (including exile), but really how many of them were power players? If, for example, Perikles’ family lost out in the rough and tumble politics of Athens, did it really have a chance of taking over Sparta or Agora? Or both? They do in this game.